Saturday 25 November 2017. 10.00 am – 3.00 pm. McLeod’s Bay Church at Whangarei Heads was built circa 1858 by the Scottish settlers. It is one of the very few remaining buildings from that era and is probably the oldest Presbyterian Church in Northland. 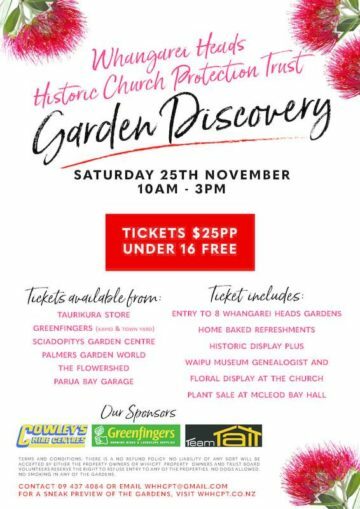 By taking part in the Whangarei Heads Garden Discovery you will help ensure preservation of the building and continued availability of it for the local community, which still uses it today. Each of the exhibited gardens has been lovingly created to complement the natural beauty and make the most of the stunning vistas that is abound in this area. Sub-tropicals, exotic plants and shrubs, vegetable and fruit trees all flourish in the warm, humid climate here. Get inspiration for your own garden or simply enjoy a relaxing day out with friends. Join us for a complementary cup of tea or coffee and a cake or sandwich at McLeods Bay Hall and get a feel for the sense of community that makes this place so special. Take a look at a floral display in the historic Church and have a look at the collection of historical photos that will be displayed at Taurikura Hall. Tickets $25.00 per person – Under 16 year old free. Tickets may also be purchased at McLeod’s Bay Church (Stuart Road) on the day. For more info visit the Whangarei Heads Historic Church Protection Trust website here.